A full winter test of our Ultimate Outdoor cover. As we all know, this time of year the weather is extremely damp and wet. 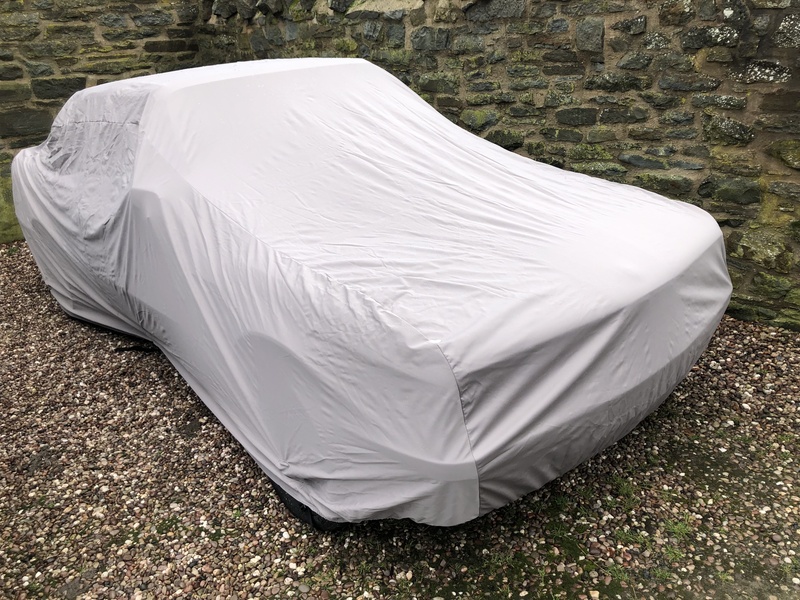 It’s of course the ideal time to use a car cover, but lots of people often wonder whether using a cover in this damp weather will affect the car underneath. The main cause for concern is trapping moisture underneath the cover if the cover isn’t breathable. 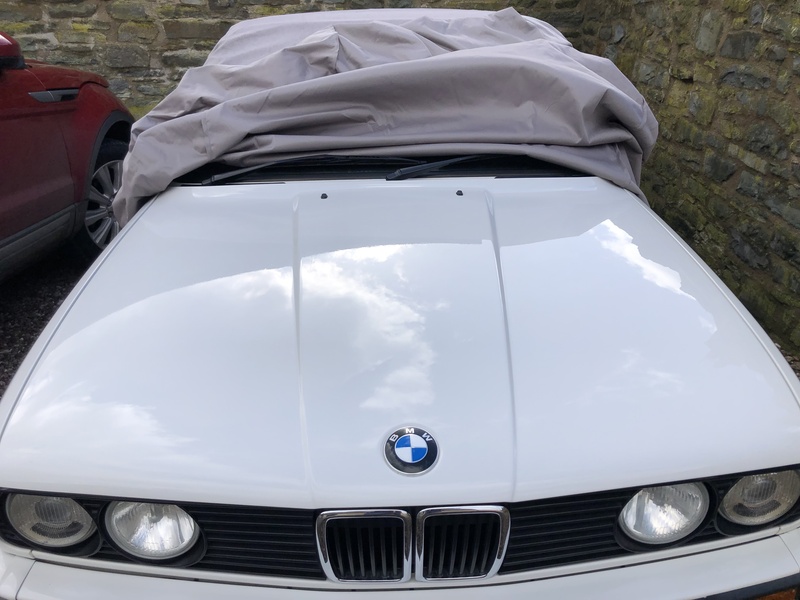 It is an understandable concern, as you can imagine water sitting on paintwork/soft tops/trims with a layer of fabric would be an ideal environment to cause damp. 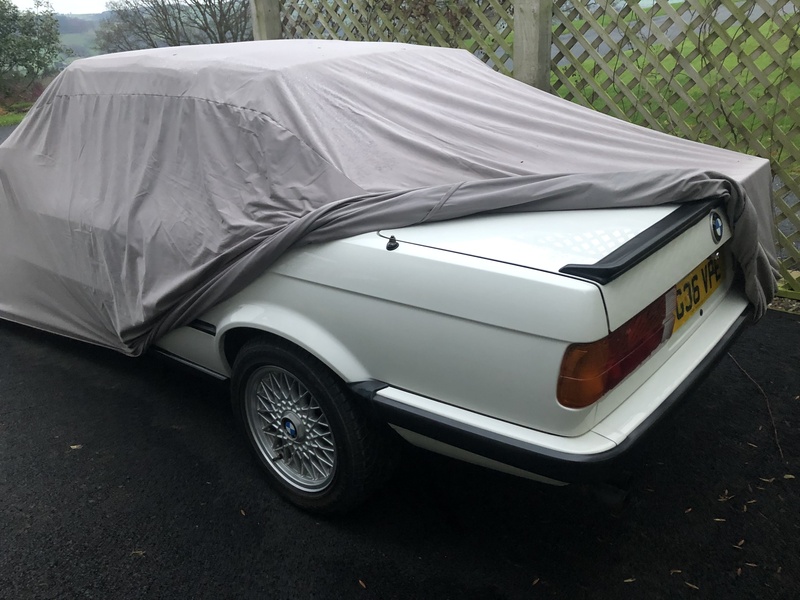 This however is not the case with our Ultimate Outdoor car covers. 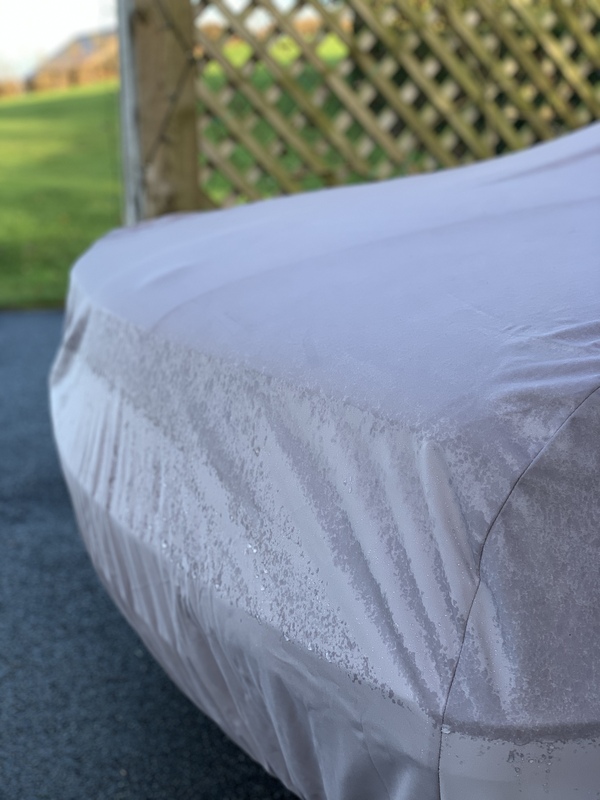 All the full outdoor covers that we make are fully breathable, meaning any water or moisture underneath the cover will simply evaporate through the fabric. The Ultimate Outdoor covers are fully waterproof, yet still fully breathable. They are so breathable that they can be put on a wet car. The covers are made up of a three layer interwoven fabric, which has a waterproof membrane as well as a nanotechnology coating which simply lets the water roll off the surface of the cover. These covers should be able to withstand heavy rain, snow and ice. With the addition of three fully detachable straps, these covers will also be nice and secure in all normal winter weather conditions. 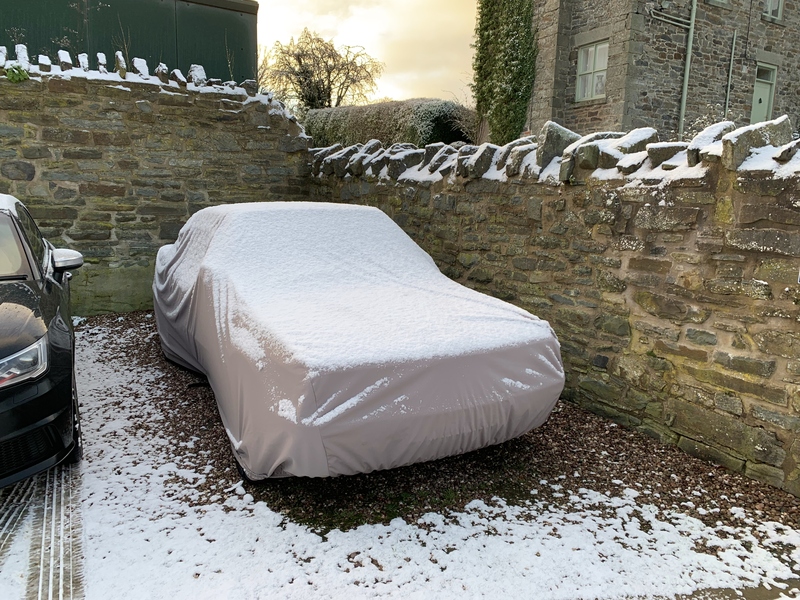 We have decided to really put one of these Ultimate Outdoor covers through its paces this winter, and wanted to see exactly how well it performed in a real life situation. We have found the dampest area we could, where the car is parked between a building and some trellis fencing; all situated against a large bank. The building, bank and trellis should help provide protection from the wind, which would mean the cover dries more slowly, hopefully testing it further. The cover we have used is a size M Ultimate, which actually isn’t brand new, so once again, trying to provide a more rigorous test. 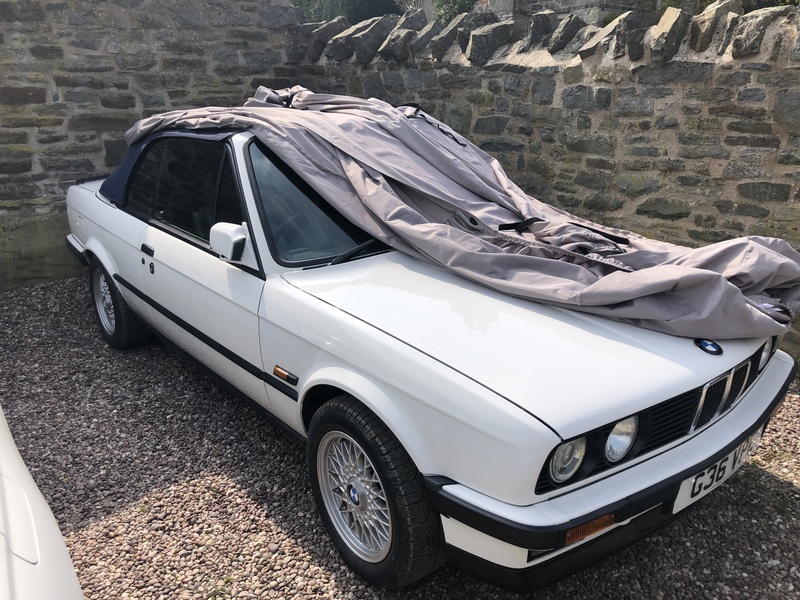 The car used is our little BMW E30 Convertible, just so we can test how it performs over a long period of time on a fabric soft top. We purposely chose this car, as it has recently had its two rear wings resprayed. 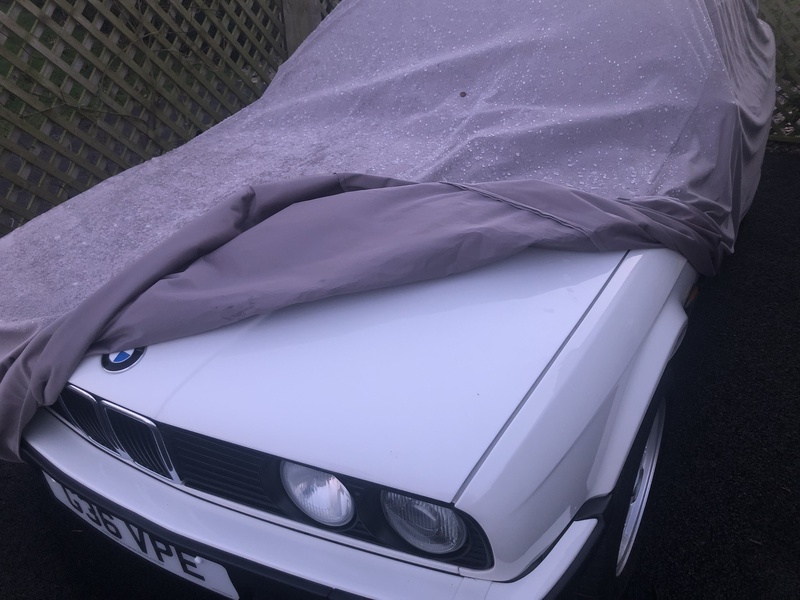 We usually don’t recommend using an Ultimate Outdoor cover on a resprayed car. This is not due to it not breathing; it is more because of the physical weight of the cover on the paintwork. If the car hasn’t been oven baked, then sometimes the paint can take 6 months or more to fully cure right through. 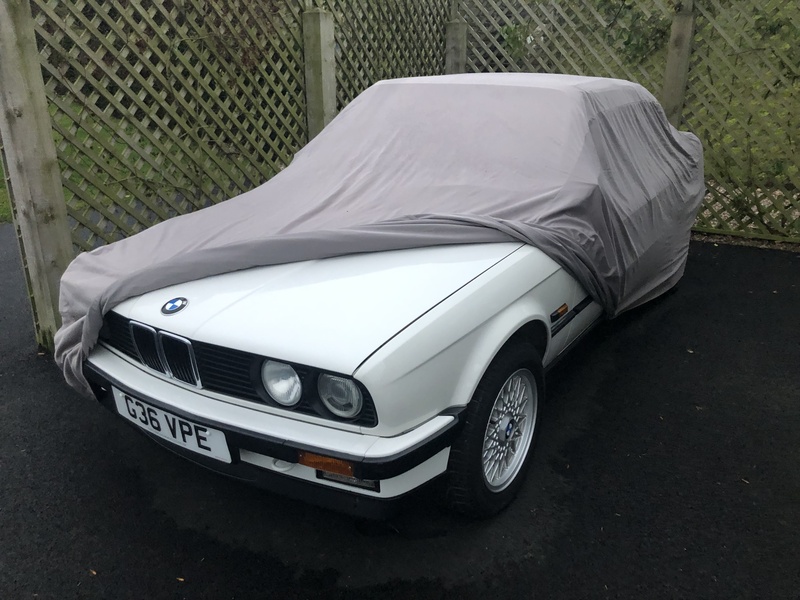 We suggest using a Lightweight cover instead as these are really light so they won’t put any unnecessary pressure on the paintwork. Resprayed rear wings shouldn’t be much of an issue, as this is a vertical surface, so there shouldn’t be much pressure on these areas from the cover, but that said, we thought it would just be another element to add to our test. 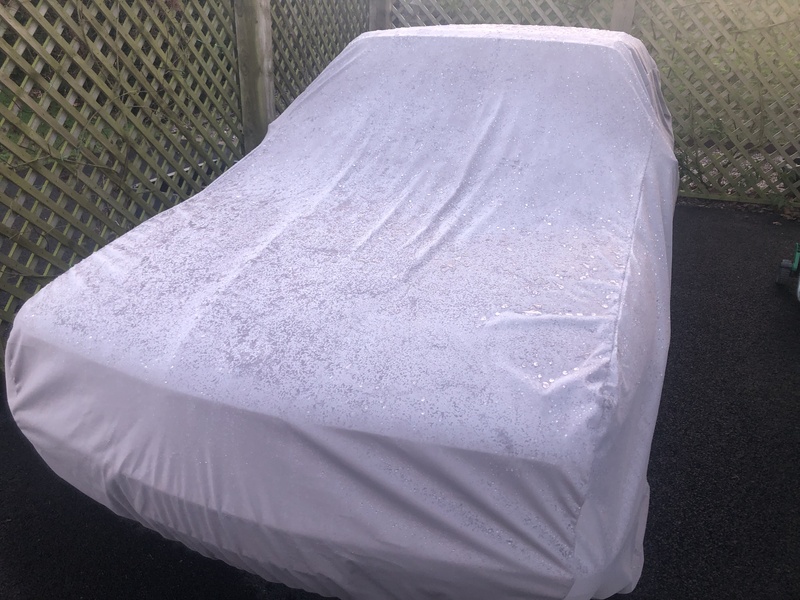 Over the winter, we will be keeping this blog regularly updated with photographs and how the cover is performing, any water seepage, dampness, condensation etc. Keep an eye on the blog and updates below! 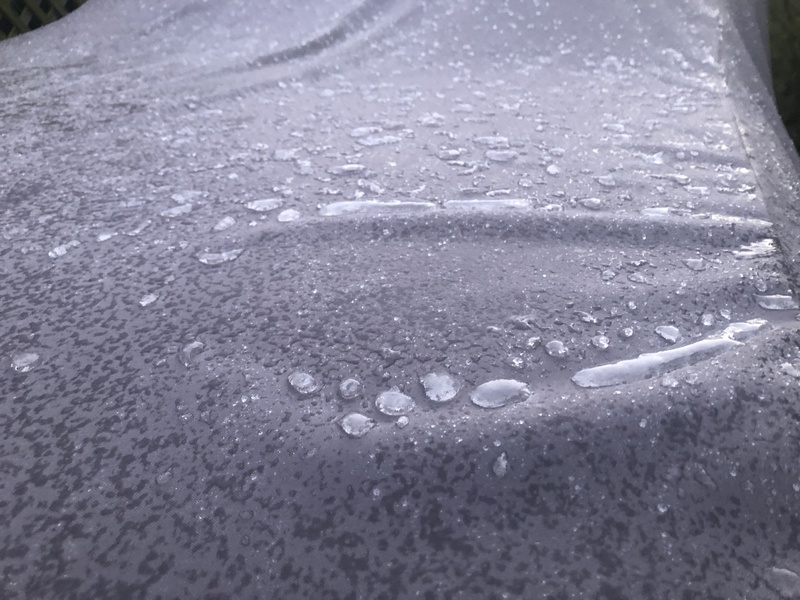 After leaving the cover on the car for 24 hours, and overnight, we thought we would check the cover first thing in the morning, as this is when condensation is most likely to be under the cover – when the bodywork is cold causing a small microclimate under the cover. It hadn’t rained much at all that night, so the cover on the surface was only slightly damp. We lifted the cover up, and underneath the cover was bone dry on the inside, and so was the car. 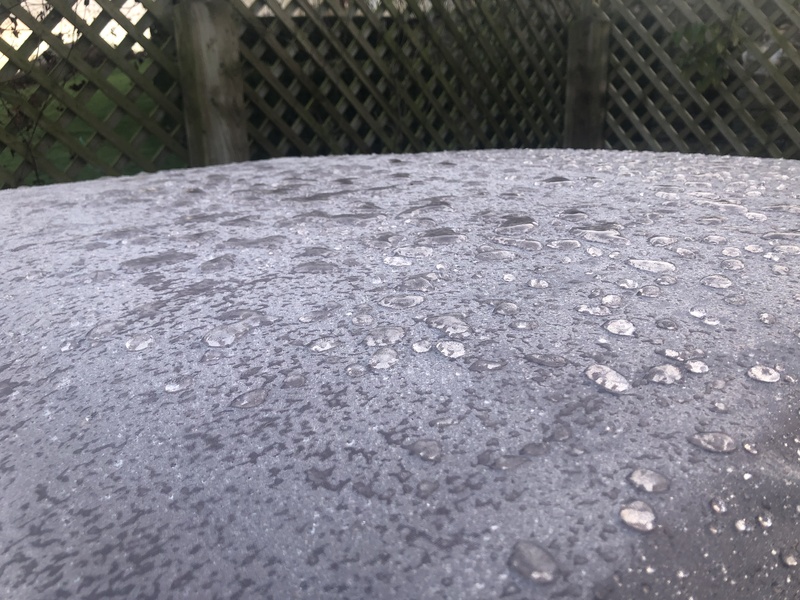 There was no condensation on the car at all. Once again, we checked how the cover and car were doing. It had rained fairly hard overnight too. The surface of the cover wasn’t letting the water through at all; it was all sitting there on the surface in lovely little beads. In fact the water was displaying exactly the kind of hydrophobic beading we all strive to achieve on our cars when we have polished them! Once again, the car was bone dry with no condensation building up underneath. 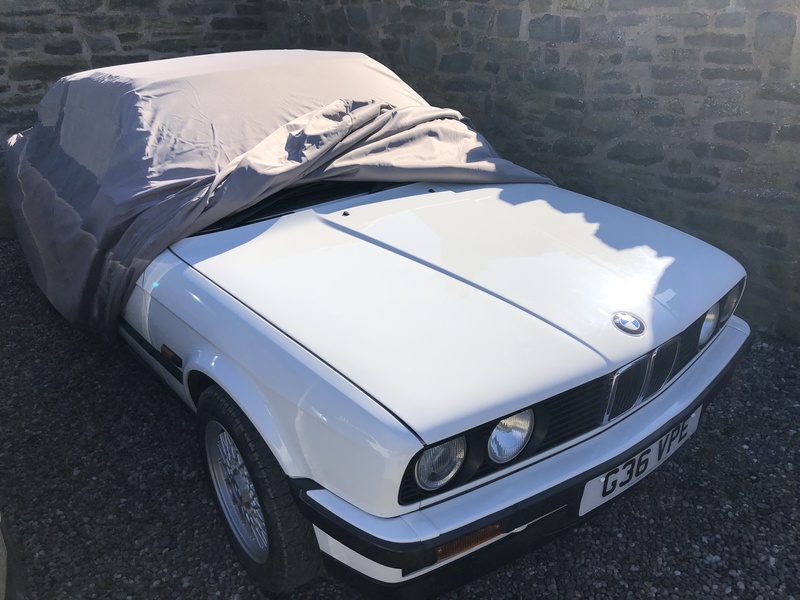 The working week was nearly over, so we thought we would check on the E30 and its cover. What was even better was that the temperature was sub-zero overnight, so first thing in the morning the cover was covered in frost. The fabric was of course extremely cold and slightly crisp where it was frozen. Underneath the cover, the car was bone dry, and nothing was coming through the fabric. There was no condensation apparent either. Overnight, it rained really very heavily. So heavily that we had lots of localised flash flooding on the country roads. We checked the cover in the afternoon, to see how it had faired after all the torrential rain. The cover surface looked damp, so the water had started to soak into the fabric. That said, water was still beading and rolling off the fabric. 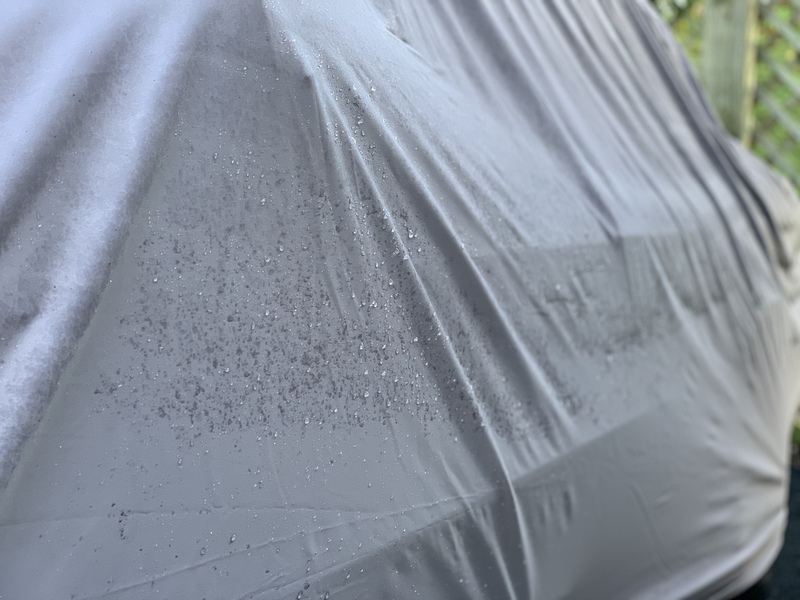 When we took the cover off the cover felt heavier where the water had soaked in, however the water hadn’t penetrated the fabric and the car was once again bone dry. 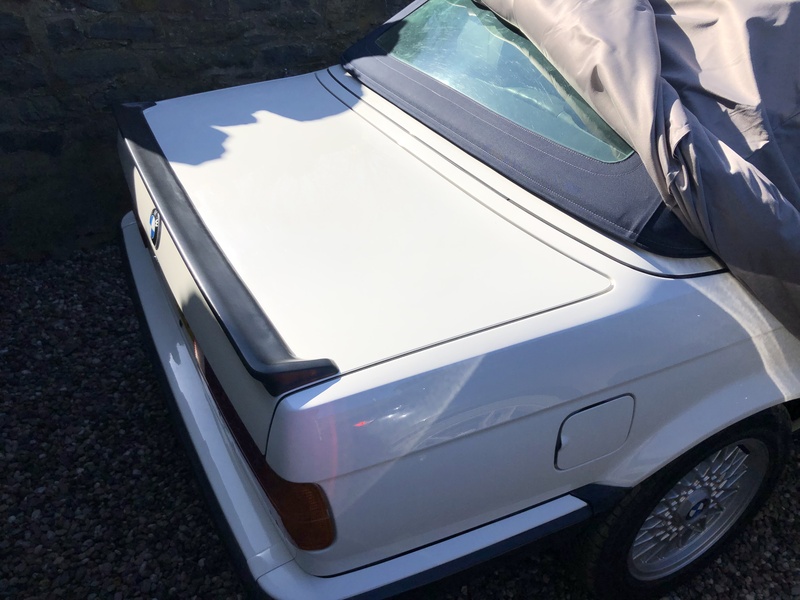 You can see from the photos that the location of the car has stayed damp, considering there was no rain since the night before and the sun hadn’t really hit that spot all day. We took the cover off the car completely, just to check the whole car. All areas were dry, and so was the underside of the cover. After so much heavy rain, we wanted to see how the roof was on the car. The fabric felt cold and perhaps slightly damp feeling, but this little dampness was from the atmosphere rather than any water ingress. 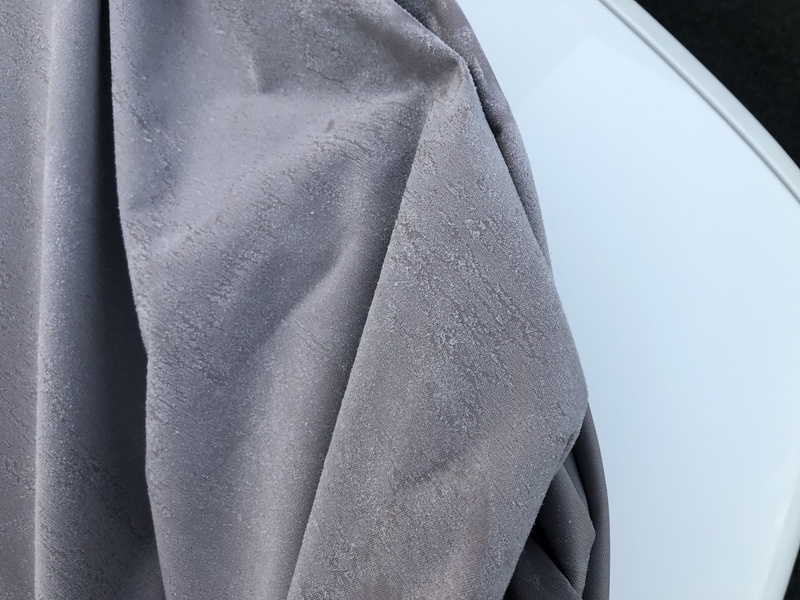 There was no condensation on the car when we took the cover off, nor was there any condensation inside the car. Once again, last night and all day today we have had heavy driving rain here on the Shropshire border. We left the cover on throughout the day and checked it this evening once the rain stopped before it fell dark. The cover looked soaking wet on the outside once again, however underneath it was completely bone dry. We are back after the Christmas break, and the cover has been on the car since we left. We have had heavy rain for a few days this Christmas, and then it has been -3 degrees C overnight and most of today. The cover again has been very icy and frosty on the surface, however underneath, the car has stayed completely dry. This also included the fabric roof on the car. 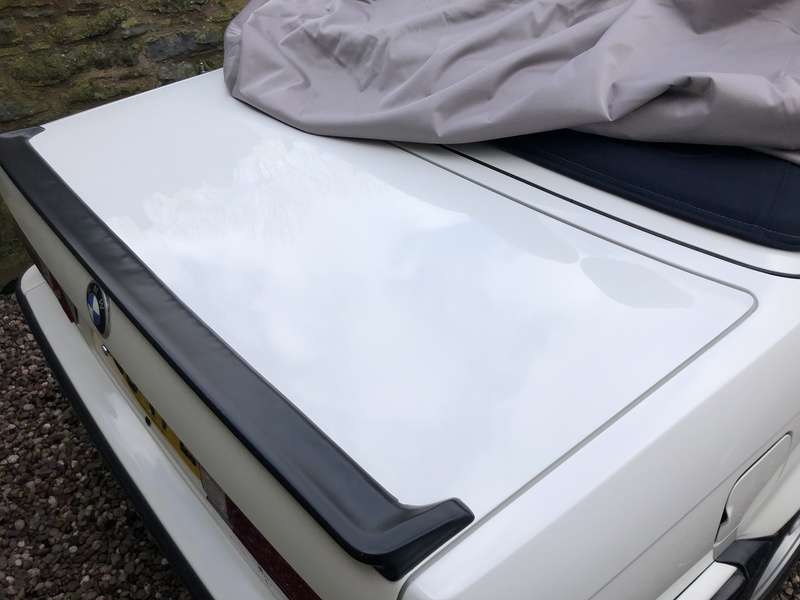 The resprayed wings of the car are still in perfect condition, showing the cover is still completely waterproof and breathing properly. The car hadn't been started for a couple of weeks, and considering the battery is very old, the car started first time this morning. We don't know for sure, but perhaps the cover has kept the battery nice and warm. We have left the cover on for a little longer, and the cover has endured all kinds of odd weather. 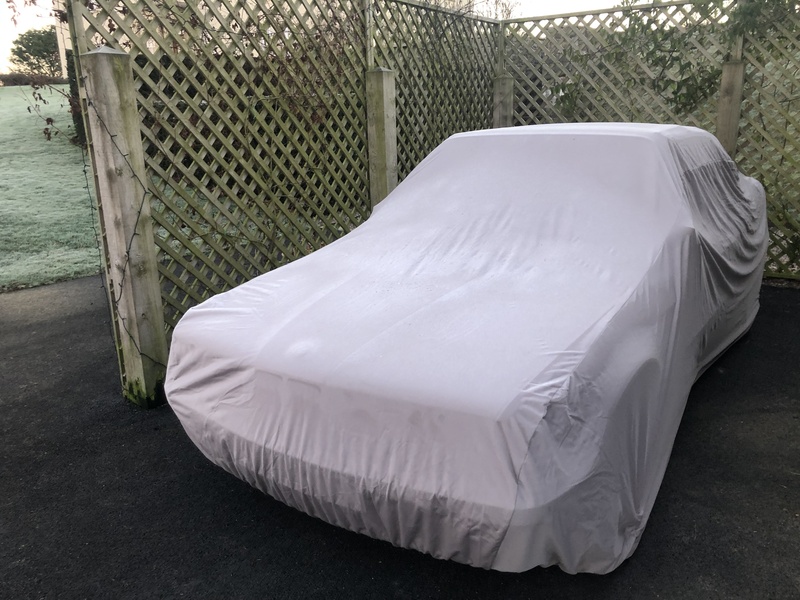 The cover has seen quite a few changes in temperature, where one day it will be around 10 degrees, and then the next it could be frosty in the morning. 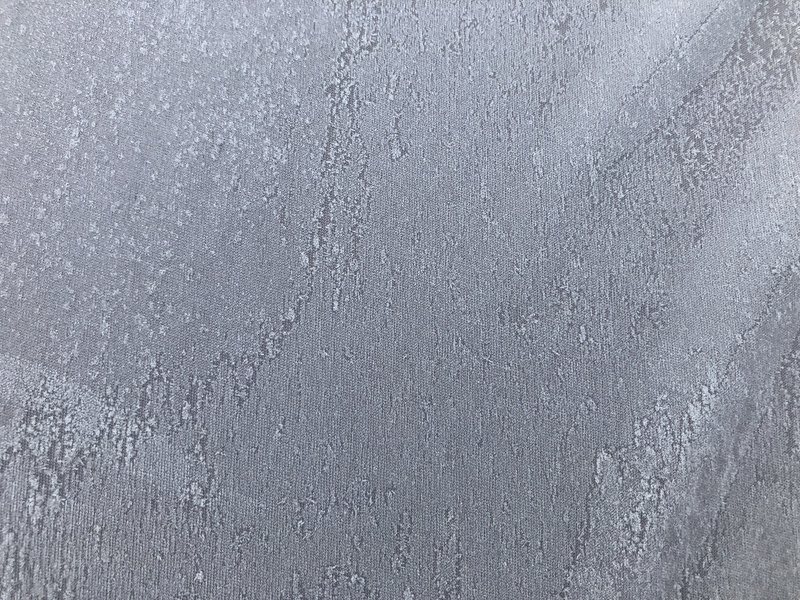 This fluctuation in temperature can be a cause for concern, as condensation can form quite easily under the warmth of the cover. Today, the weather was back to being cold, and this was after some heavy rain. The cover itself looked like it had lots of water sitting on the surface, but it turns out this was frozen completely. 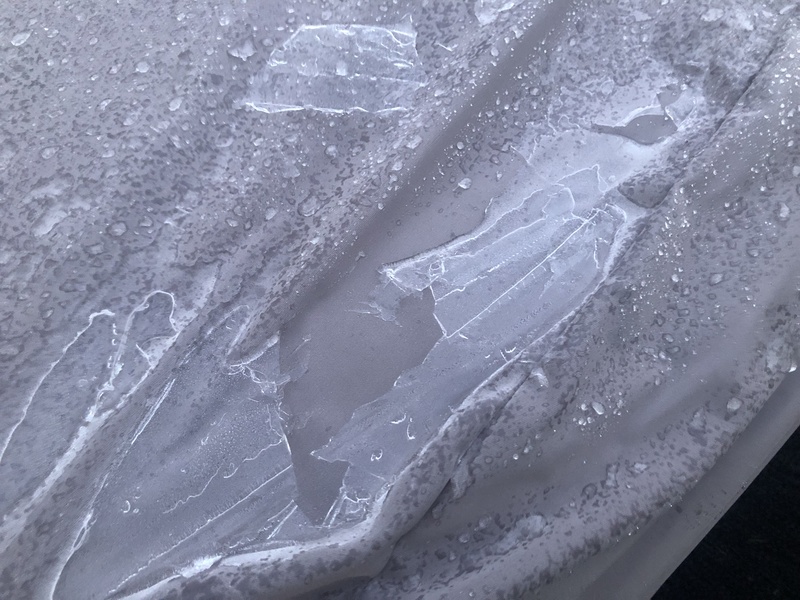 The whole cover was very firm where the water sitting on top had frozen together, but underneath the cover, the car was completely bone dry. The cover itself, did have some slightly damp patches on the inside. 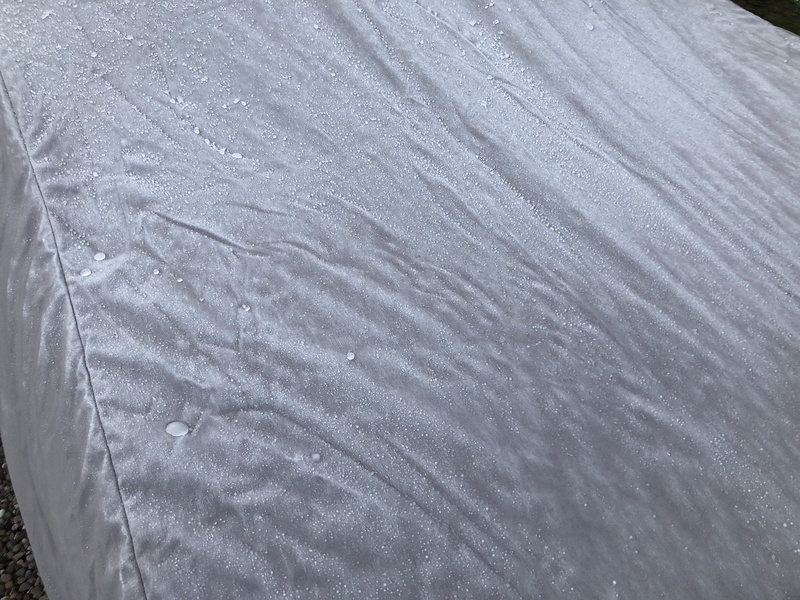 This appears to be where the water has been frozen and has slowly started to defrost so essentially holding water agains the seams of the fabric for a very long time. 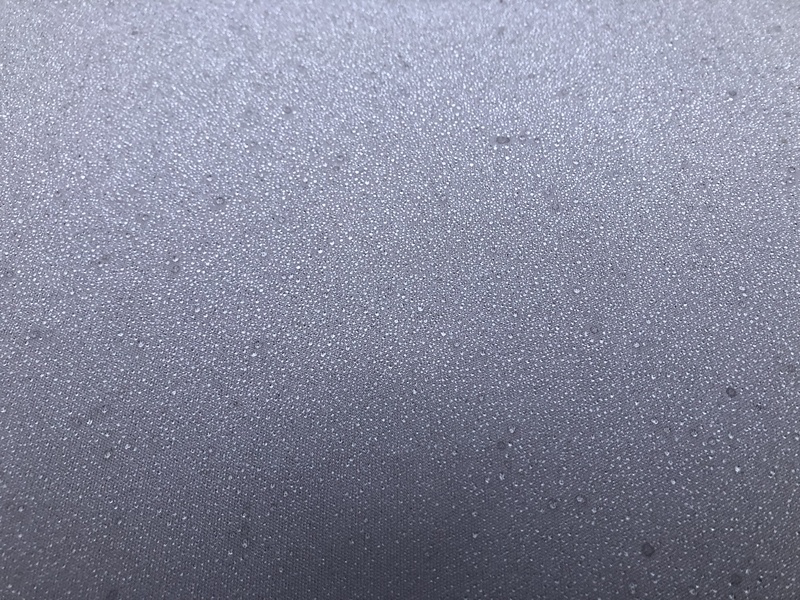 No water was on the car itself, so any moisture under the cover had clearly evaporated away. A few days later, we have checked the cover again. 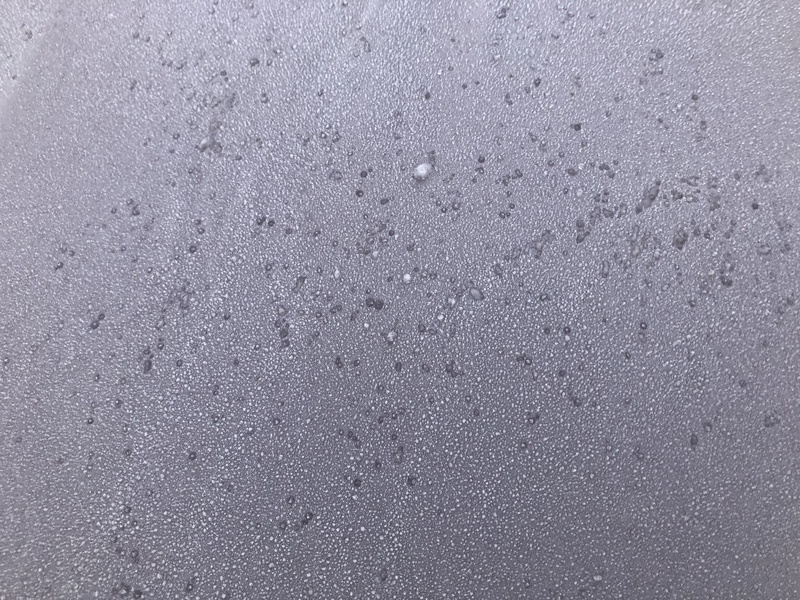 Another very cold frosty day, so again the state of the surface of the cover was the same - water droplets frozen all over the cover making it crisp to the touch. Upon removing the cover, there was absolutely no sign of any water or moisture underneath. Overnight, we had some snow in Shropshire. We had a couple of centimetres here at the office, so it was great to see the cover under some snow. The snow made no difference to the cover at all, with it all just sitting on top and still staying waterproof. 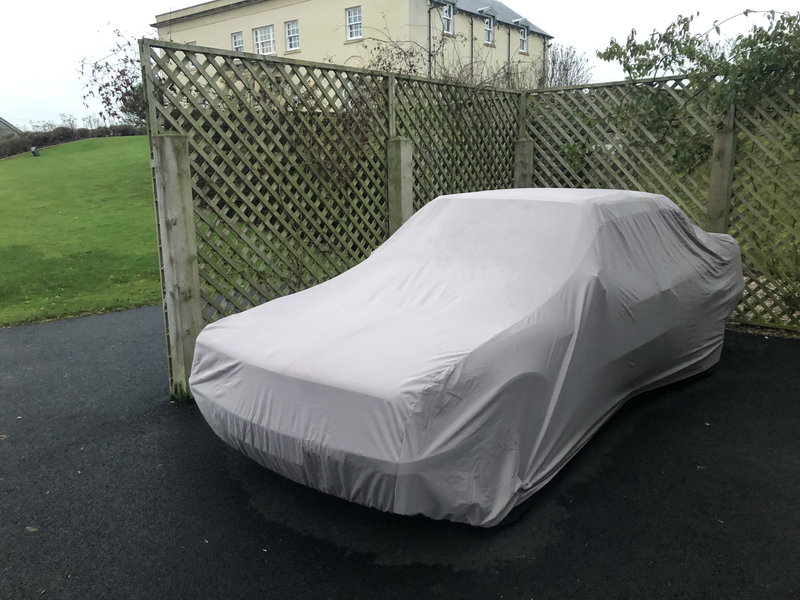 On day 46, we thought it might be a good idea to put the cover on a slightly damp car as another little test. The car was uncovered for a short while, and then at around lunch time we put the cover onto the slightly damp car. It wasn't wet, but just slightly damp where some condensation had formed in the morning from the bodywork being cold. We then left the car all afternoon and overnight before we checked again. We had some rain, and it looks like the water had not gone through at all, and the surface has also dried since the rain overnight. 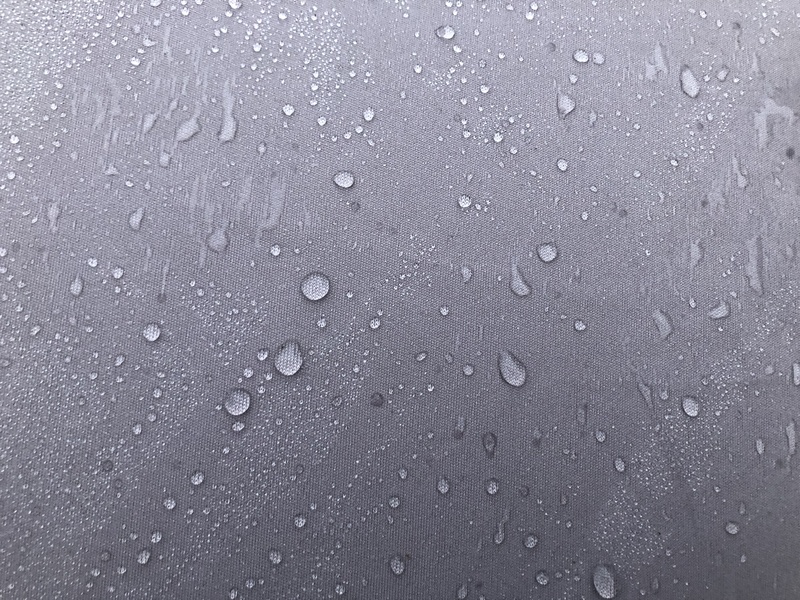 The moisture underneath had also evaporated away. Day 50 proved again the cover was working perfectly after some rain at night and sub-zero temperatures. The cover was covered in frozen water droplets first thing in the morning, but yet again completely dry underneath. We have purposely left the cover on the car for a longer period of time, to give it another slightly different test. 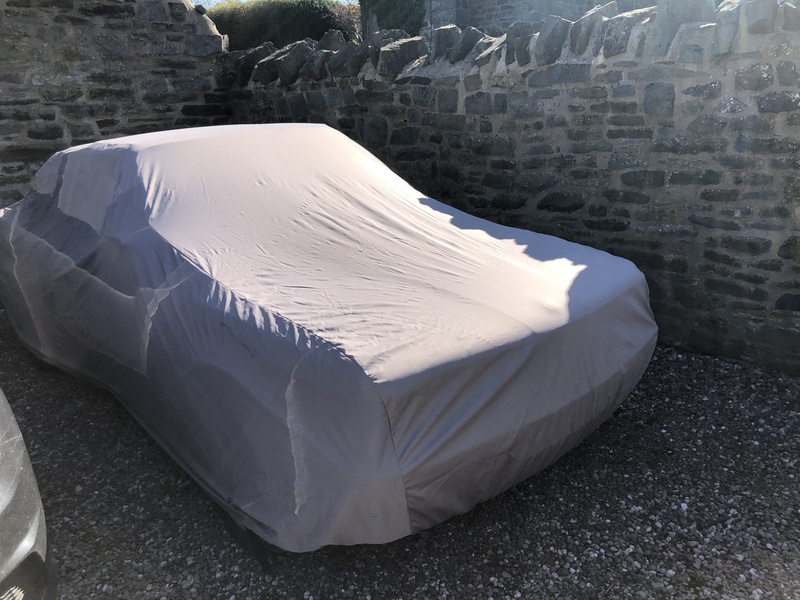 Admittedly we have had the cover off the car for around 3 days while we had that stunning weather in February. It was just such a great opportunity to run around in with the roof down for a few days! Aside from those three days, we have had particularly grim weather here in Shropshire. It has been quite wet, and in the last week or so we have had some really stormy weather, as well as some warmer days and frosty days. It rained extremely hard last night and blew a gale, to the point where we have had some flash flooding overnight, so we thought it was worth a check under the cover today. 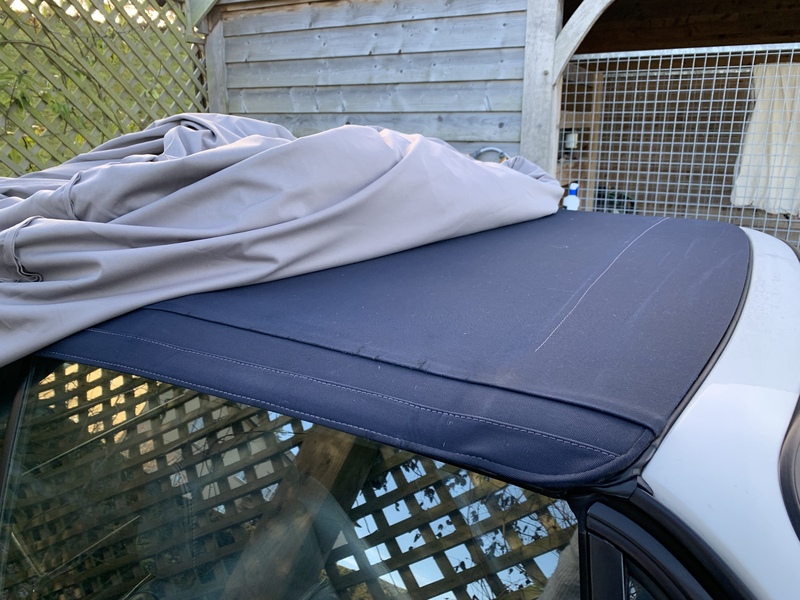 The cover itself hasn't moved at all in all the wind; the straps have kept it nice and secure on the car. Appearance wise, the cover looked wetter than usual. Most of the water had run straight off the cover, however some had started to soak into the top layer of the fabric. It didn't penetrate the waterproof breathable membrane in the fabric. Upon inspection, the car was bone dry underneath when we lifted the cover off. The paintwork was immaculate, clean, dry and still shiny. The roof was also not wet and no mildew had formed, meaning the cover has still been breathing as it should. We checked the resprayed rear wings, and again they were perfect. 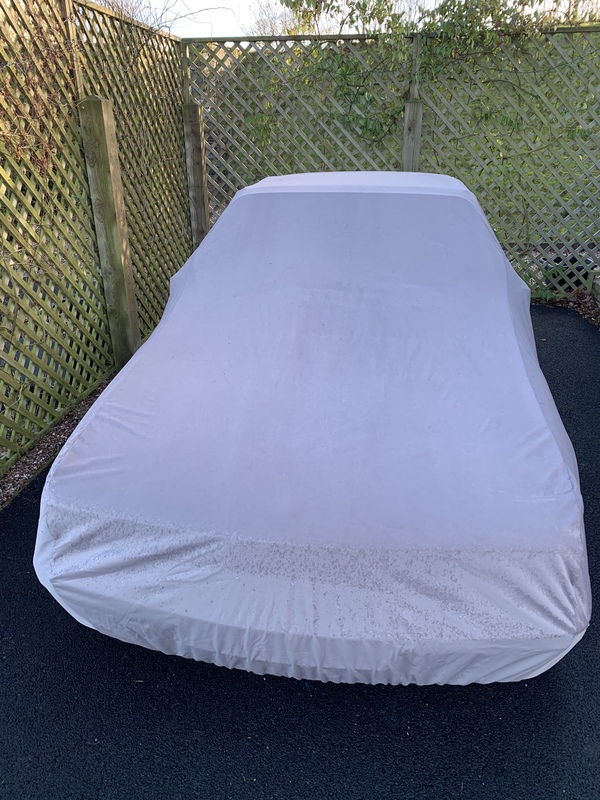 The car has been covered up in some damp weather for a week or so, and we have left it for a few more days in the glorious sun we have been having. 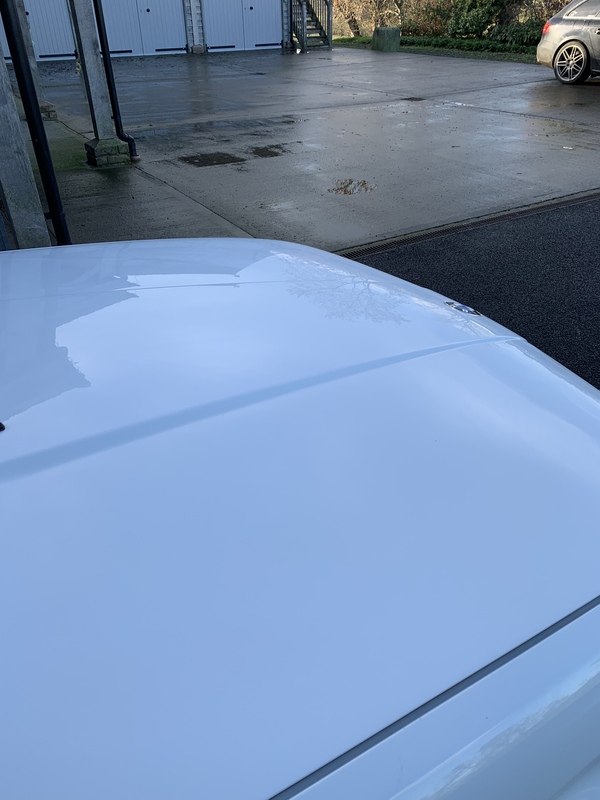 The cover is still performing perfectly, no moisture underneath and the car looks as good as it did the day we put it on. It has been another few weeks of leaving the car untouched and the cover on top. The weather has been a real mixture again, with rain, wind and now 15 or 16 degrees. Once again, the car is perfect underneath. No water has gone through, no condensation and the paintwork looks as shiny as ever. It won't be long until we conclude the winter testing for a short while. 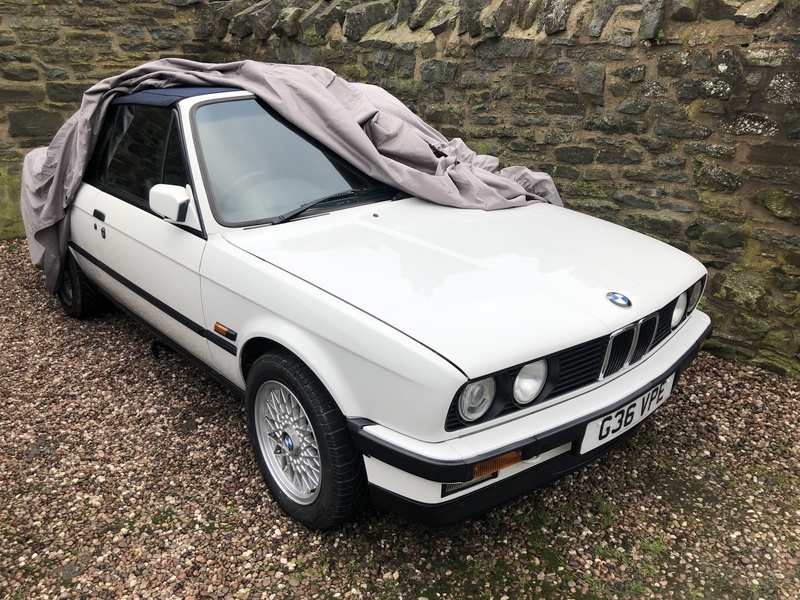 As the weather gets better its great to have the E30 in use again with the roof down. We will of course resume the test when the car gets put away for storage.